Milan Art Tour departs at several times, the first departure is at 8 am, the last departure is around 4.30 pm. Before 10.00 or after 15.00. We are comparing Milan Art Tour and Last Supper Prices from leading ticket suppliers and Try to find you Cheap tickets prices on the market. The Milan Art Tour is a must for anyone interested in art or history, or anyone who would like to see some of the less well known locations of Central Milan. Let your guide lead you through the winding streets, away from the crowded Piazza's and busy roads, to San Maurizio al Monastero Maggiore (The Sistine Chapel of Milan). Inside you will find the vibrant frescos painted in the 16th century by the students of the great Leonardo da Vinci. You can also discover Sforza Castle and Donato Bramante's masterpiece inside the church of Santa Maria presso San Satiro. This tour also takes you to modern and contemporary artworks such as Maurizio Cattelan's ‘Finger'. The Milan Art Tour wouldn't be complete without visiting ‘The Last Supper' therefore you will either meet or end your tour in front of the church of Santa Maria Delle Grazie. Feel free to ask your guide any questions and for recommendations for your stay in Milan. If you've got a passion for art, as well as history, and an interest in discovering the main sights of Milan then this tour is perfect for you. Handy for anyone on a short vacation because the compact walking tour is only 2 hours long. Convenient for anyone who wants to visit The Last Supper. Your Experience With Milan Art Tour and Last Supper? Visit 2 of Milan's most famous artworks, Leonardo da Vinci's ‘The Last Supper' and Maurizio Cattelan's ‘Finger' statue. Enjoy fast-track entrance to one of Milan's top attractions and explore Milan's artistic side with an expert guide. Take a relaxed walking tour of the city, stopping at lesser known locations such as Santa Maria presso San Satiro and San Maurizio churches. What Milan Art Tour and Last Supper Includes? Skip the Line entrance to Da Vinci's ‘The Last Supper'. 2 hour walking tour with professional, English speaking guide. Headsets/audio guides for groups of 10+. Book in advance if you plan to visit during the peak season. Book the Art Tour and The Last Supper entrance ticket together in order to get the best price. 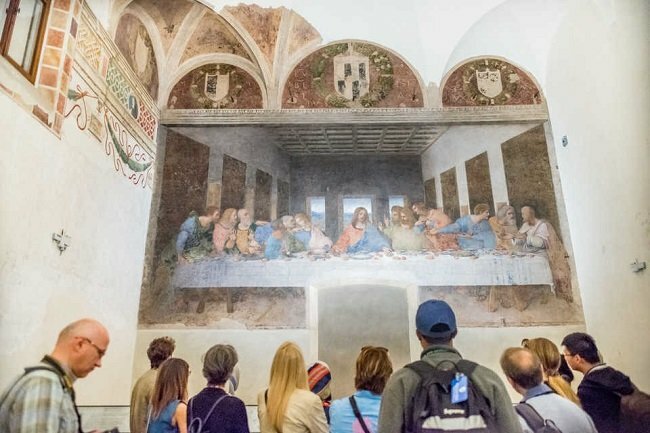 Travelers Reviews about Milan Art Tour and Last Supper? Travellers say that this is a wonderful and very informative tour. Comments agree that the small group size and enthusiastic guides make the tour very high quality. On Get Your Guide the Milan Art Tour and visit to The Last Supper has 4.7 out of 5-stars. On both Viator and TripAdvisor the experience has a perfect 5-star rating. Parts of this tour may not be wheelchair accessible. Bring your ticket in paper or electronic form. If cancelled less than 7 days in advance cancellation fees may apply. (Depending on your tour provider). Group size is a maximum of 30 people. Shoulders and knees should be covered to enter any churches.